So, after the usual excuses for not updating the blog, I get on to the actual news (me being late is not news), which makes some of this rather old news, but since you may not have heard it, I'll take the chance. More tracks have been converted to be 0.7-compatible, one of them Snow Tux Peak, thanks to Varivar. It has been somewhat updated as well, with a cool sound effect when driving on the bridges somewhat before the finish line, which showcases a new feature for track designers: terrain spesific SFX. Also, XR591 is now compatible (not sure who I should credit), with a couple animations in as well. 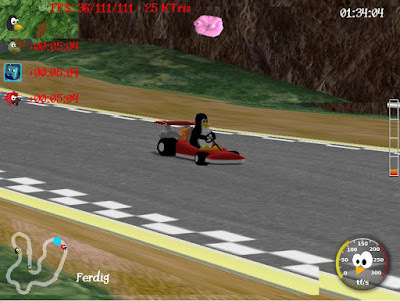 On a related note, the Hexley kart has been converted, and more kart animations have been added. I should really turn on "Sync to VBlank" when I take screenshots to avoid these jagged texture-update edges. Will try to remember it for next time. There are now intro, last lap and outro music jingles in the game, created by Dundersylt. Thanks! A new track ending camera is now for testing in The Lighthouse track, where the camera no longer just follows the kart, but is at a fixed position from a distance and changes angle and position continuosly to follow the kart. Pretty neat! Throw in a good amount of code cleanup and bugfixes, and we should hopefully, according to the Grand Master Joerg, be a little closer to a beta/RC release. Expect that to take some weeks, though. In fact I'm happy STK is developing step by step. I've compiled svn version today, played Snow Tux Peak and noticed that sound on the wooden bridge. Nice work! There are some bugs, though, and I'll post them on the Sourceforge today. Anyway, keep on working and the game will become better and better! 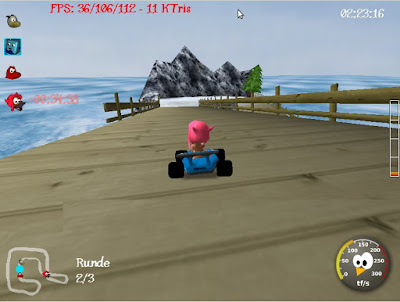 Looking forward to more news about supertuxkart! Looking forward to this already!! I'm loving the progress being made on this awesome game. I wonder if it would be possible to compile any of it into an Alpha 3 for those of us who can't get the SVN to compile properly. Yeah! Please do an Alpha 3. I have checked out the SVN but have problems to build it. Florian, if you have any problems building it, please contact us (best in the forum) - we want to make building STK as smooth as possible (and I think it usually is). Ok I have now built it successfully. 0.7 is a really great progress! That game rocks!